If skulls attended parties, possibly, we could see them during fireworks. Skulls and fireworks are also the main motive in these series of her works. Fireworks are the ones creating intermitted light, and it is during those moments that suddenly all kinds of events can crawl out of the light. The skulls are all dressed up – visually immensely enriched, supplemented with jewels and lace of different materials. Those in the dark and underground are ready for the feast, and that is the main idea. 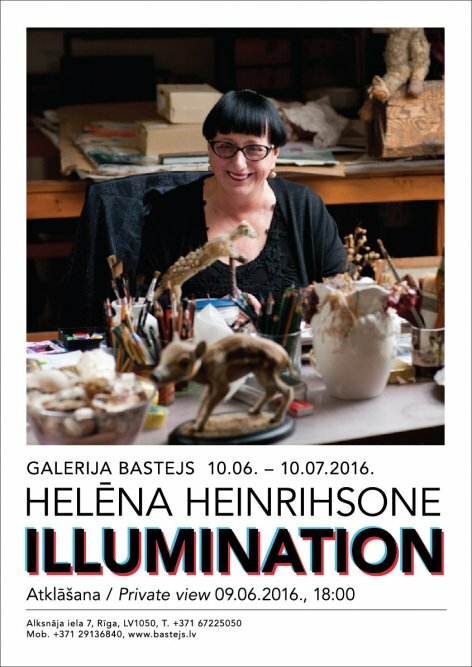 Perhaps each of Helēna’s works individually can be viewed as a small firework. They are much more interesting than a large-scale works, because the small fireworks are more pure, they are finer and still a bit cunning. And standing by the artist’s work it is interesting to imagine yourself being there a brief moment after outbreak, your eyes barely accustomed to the expressively saturated colorfulness and seeing what had been hidden in the dark.